In the shadows, massive Liebherr cranes idle, a constant hum against the clank of steel against steel and the high-pitched whine of angle grinders as they spray sparks into the night. The inky black Clarence River in northern New South Wales ripples below unseen as workers toil on the new 1.5-kilometre, four-lane bridge under construction about 20 metres east of the existing crossing – part of the $4.36 billion Woolgoolga-to-Ballina Pacific Highway upgrade jointly funded by the Australian and NSW governments. The old box-girder Harwood Bridge still groans and rumbles as trucks tackle the midnight run down the Pacific Highway. The bustling crane crew know their job; aside from the inevitable banter between colleagues there’s little in the way of loud instructions. Two-way radios crackle, dogmen signal and the idling cranes roar into life. This is a professional team working in unison. 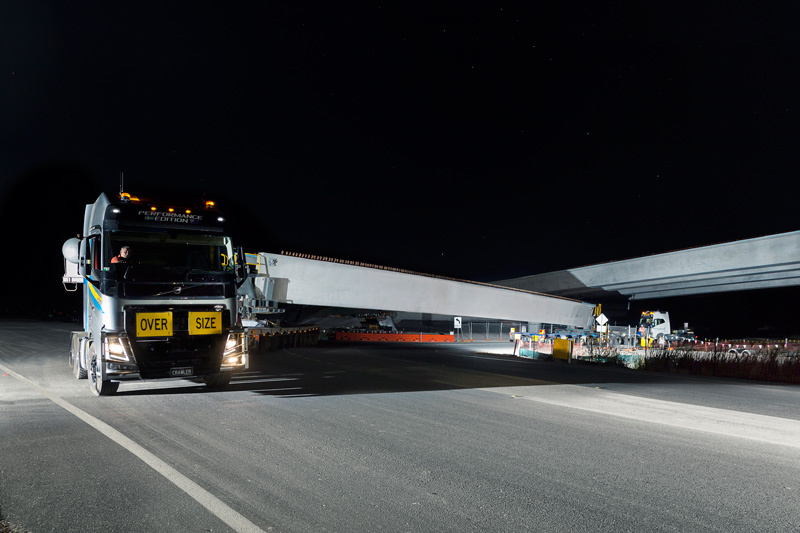 Suddenly, a massive 170-tonne concrete bridge span rises into the darkness; another beam is put in place and the industrial dance continues through the night. On the edge of darkness another cast member cranks to life, headlights flick on and amber safety beacons begin to pulse, invading the shadows. It looks just like any other Volvo FH16 prime mover, save maybe for some eye-catching paint work. However, this is no ordinary highway truck; it has a secret weapon hidden away under its silver cab. This FH16 700 is equipped with crawler gears and is rated to haul loads of 240 tonnes gross. Heavy haulage is demanding and unforgiving work. Total control both of the vehicle and the surrounding environment is a must. An error can result in massive damage to life, limb and infrastructure. Traditionally, heavy haulage trucks have been a customised creation. 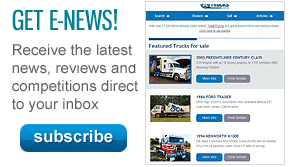 Auxiliary transmissions, and multiple drive axles, are usually the norm. Altered wheel bases and other changes often make the truck fit for one purpose only; hauling loads that would break the average vehicle. Compared to the modified heavy haulage beasts of the past, the Volvo looks unassuming. Looks, however, can be deceiving. 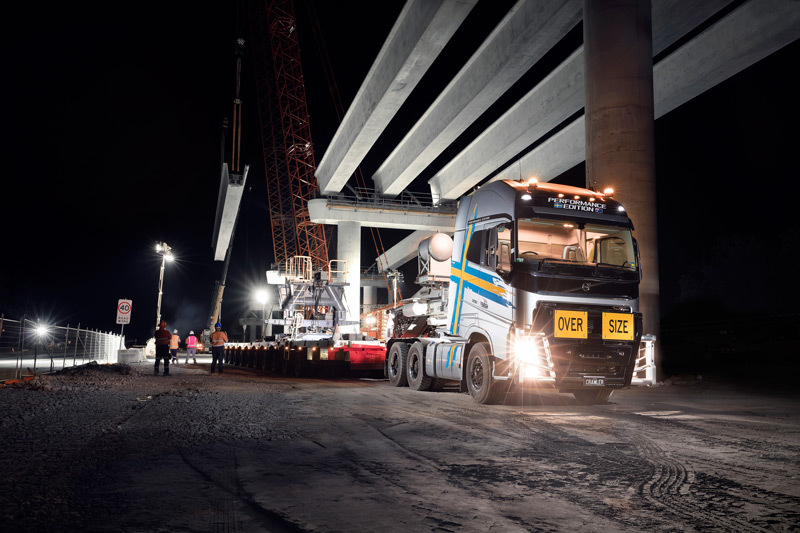 Under cover of darkness two ultra-low crawler gear (ULCG) equipped FH16 Volvos have been transporting 170-tonne concrete bridge beams to site. The entire combination tips the scales at 300 tonnes. The two 10-axle trailers alone sit on 80 tyres collectively and weigh close to 50 tonnes each. The front trailer is pulled by one Volvo, the rear trailer is pushed by the other, and between them sits the massive concrete bridge span. A combined total of up to 1,400hp and 6,300Nm of torque is being multiplied in the transmission and is fed to the drive wheels of the two trucks. Up to a massive 700,000Nm is turning the tyres of the FH16s. It’s an operation that requires both a skilled team and mechanical precision. Watching the two-truck combination start to roll on its next load is an impressive sight. Interestingly, there are no roaring engines or slipping tyres; there are no spectacular wheel stands as the trucks shoulder the burden. Instead the sight is spectacular because of the ease at which the load starts rolling. With practised nonchalance, the trucks idle away from a standstill in crawler mode. With a more modest load the I-shift automated transmission in each prime mover could continue to shift up through the gears without needing to stop. With a load of this magnitude, however, slowly but surely is the name of the game. The fastest these trucks will get up to is 10km/h. Despite the incredible forces at work both Volvos gently accelerate. To help negotiate the twists and turns of the route to the bridge construction site a steer man sits in a cockpit on the rear trailer, manipulating the angle of the combination as it snakes towards the main highway. Thankfully for everyone involved, the steer man especially, this shift isn’t a long one, about two kilometres in total. That said, the main highway still has to be closed to traffic while the monster load crawls across the old Harwood Bridge and around another corner where the cranes await to unload. The 16-litre engine emits a subdued yet throaty growl as it climbs across the river. Yet still the trucks retain their composure. "The crawler gears in this Volvo are fantastic"
Amongst the hardened veterans of Australian heavy haulage, tales abound of both misadventure and challenges met; stories of drive wheels rotating inside their tyres as the load struggles to move; stories of asphalt being ripped from the road surface as a loaded combination strains to the top of a grade. Tonight however, the drivers of these trucks, with decades of experience between them, know the value of a delicately placed right foot and no small degree of mechanical sympathy. Ian ‘Robbo’ Robertson drives the lead FH16 and is no stranger to hauling heavy loads. In fact, he has been in heavy haulage for more than 25 years. It’s certainly got the goods," he says, gesturing at the silver FH over his shoulder. "Over the years I’ve driven many heavy trucks, and the opportunity came up to drive this Volvo," he muses. "It’s so comfortable, but it’s really got the power to do the job." Robbo is clearly at ease amongst the towering cranes and straddle carriers. This is his office. He smiles with his entire face, showing an amiable character that has no doubt served him well over years of working as a part of a team, methodically planning out every big move. The professionalism required for these shifts is a given. 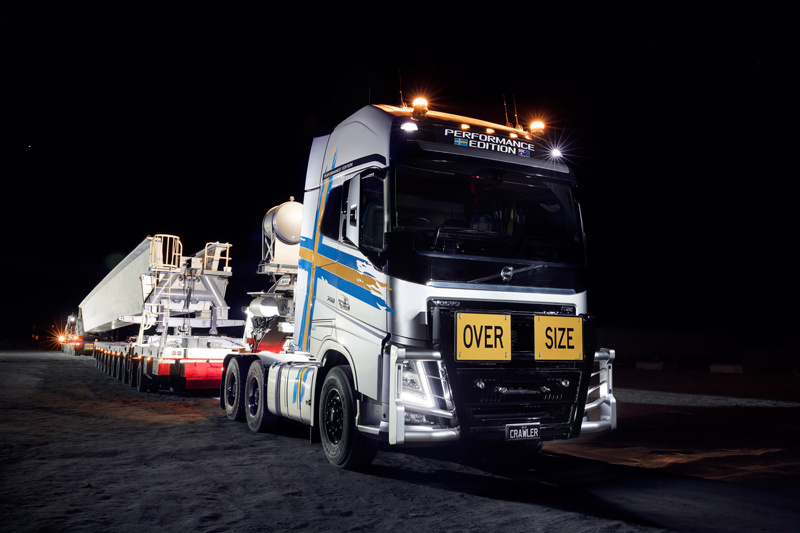 "The crawler gears in this Volvo are fantastic, most trucks like this would have a gearbox and a joey box," Robbo says. "Having all the gears in the one gearbox means that you don’t have to stop and change from high to low or low to high, you can change on the fly from Crawler 1 or 2 and so on up into the main box." "It’s a game of gears"
"It just makes it so much easier to do the job; the torque that’s there is phenomenal. 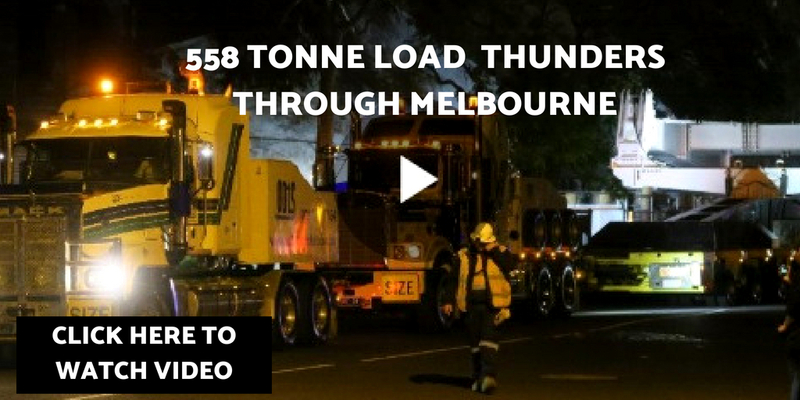 If you’re going down the highway at a couple of hundred tonnes you need to know that it’s got the goods there." The innovation within these trucks sounds deceptively simple, the addition of two extra gears at the front of the 12-speed I-shift transmission. The lowest forward ratio of the ultra-low crawler is an almost glacial 32.4:1. The final drive turns at 4.12:1. This gives the Volvo incredible start-ability under heavy load. But it’s the ability to maintain momentum once rolling that really sets the ULCG equipped I-shift apart. Other trucks fitted with auxiliary gear boxes often have to come to a halt to change gears in the secondary transmission. With ULCG the truck can climb out of the crawler ratios while on the move. 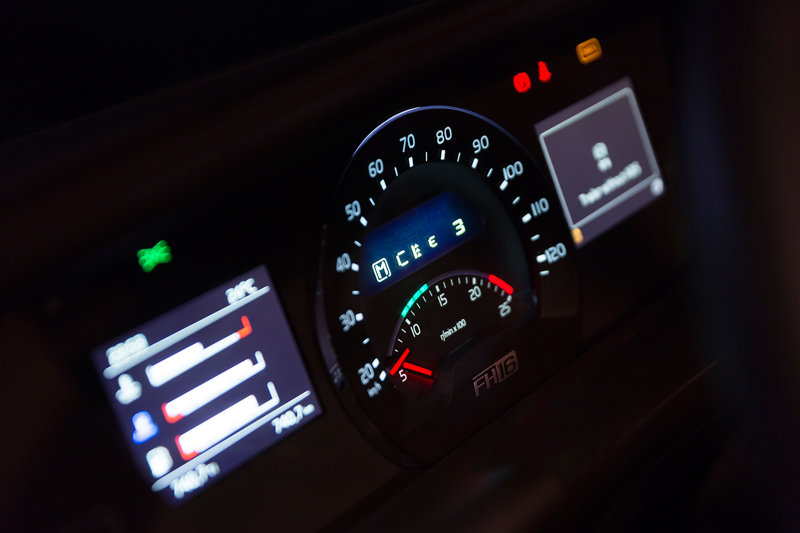 The digital precision of the I-shift’s gear changing abilities remains. The option of being able to add crawler ratios to the I-shift transmission adds to the versatility of the FH16. Crawler gears even have their place in long-haul applications. For B-double work it’s possible to option crawler gears with a taller ratio. This means the prime mover can also run a taller final drive. Ultra-low crawler gears may be about performance and productivity, however crawler gears in highway applications are all about fuel efficiency. Local testing of crawler gear-equipped FH16 Volvos in B-double applications have seen dramatic improvements in fuel efficiency without compromising low-speed performance. At highway speeds the engine revs at a point where the most is made of every drop of fuel. As the massive cranes sling yet another bridge girder into the darkness, the now unladen FH16s roll back down the road for the next run. Waiting straddle carriers have already positioned a beam ready for loading. The precision of the crane teams and the drivers is appropriately enough echoed by the precision of the trucks themselves. These FH16s have not put a foot wrong during the whole operation. 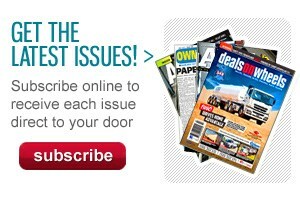 In fact, the drivers can’t speak highly enough of them. The mechanical ballet continues into the night until the first smudge of dawn marks the sky. For Robbo and the team, it’s just another day at the office. In an application where the stakes are so high and the price for failure can be disastrous, these Volvos are exceeding expectations with a gear for every occasion. 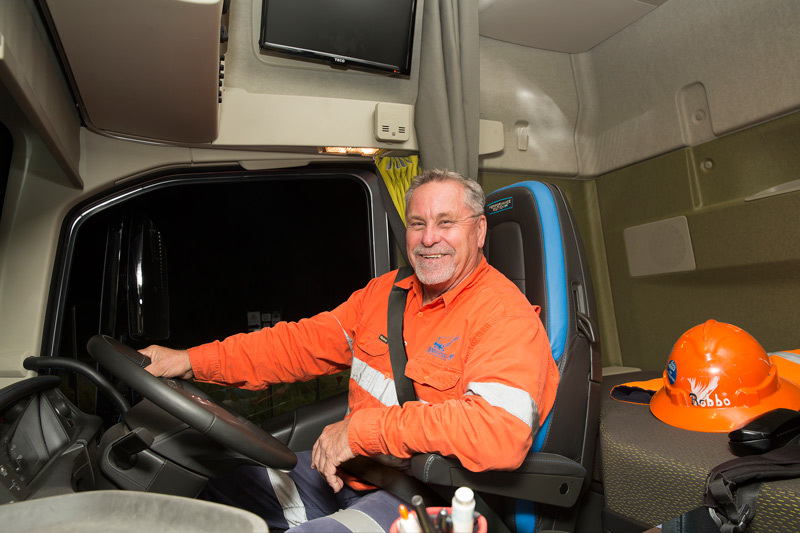 "Every job comes with its challenges, whether it’s on a mine site or down a dirt road at a couple of hundred tonnes push-pull," Robbo reckons. "It really is a game of gears."